Women make up 24% of members of national legislative bodies around the world, a share that has ticked up over the past decade but remains far smaller than their share of the overall world population, according to an analysis of data from the Inter-Parliamentary Union. At the end of 2008, by comparison, just 18% of the members of upper and lower parliamentary bodies around the world were women. The largest increases in female representation between 2008 and this year occurred in Central America (13 percentage points), the Middle East and North Africa (9 points) and Western Europe (8 points). Despite this growth, there are fewer women than men holding legislative seats collectively in every world region. As such, no region has reached gender parity in the share of women in its countries’ legislatures. As a region, the Nordic countries – Denmark, Finland, Iceland, Norway and Sweden – come closest to gender parity, with women accounting for 43% of parliamentary members. The highest share is in Sweden, where women hold 47% of legislative seats. By comparison, in Denmark, 37% of seats are held by women. Shares in the remaining Nordic countries hover around 40%. Caribbean nations are close behind, with women making up 42% of parliament members. About a quarter (27%) of North American legislators are women; in the U.S., women account for 24% of the 116th Congress. South Asia and the Middle East and North Africa region have the smallest shares of women legislators (both 17%). It’s important to note how the numbers and shares of women in legislatures around the world can differ widely and, as a result, tell different stories. The size of a country’s legislature is an important factor in this perspective. Certain countries have large numbers of women who account for a minority share of a large legislature, while others have small numbers of women accounting for a majority of a smaller legislature. For example, China’s National People’s Congress has the largest number of women (742) of all the countries analyzed. However, women account for just one-quarter of that legislature’s 2,975 members. Similarly, while the United Kingdom has the second-largest number of women in parliament (416), these women account for just 29% of a large legislative body (1,439 members). 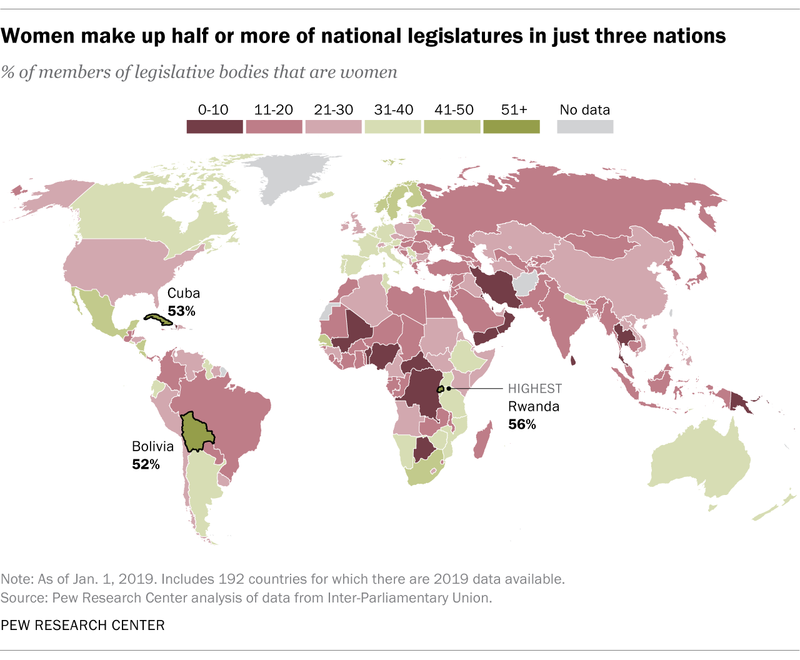 Italy, France and Germany also have comparatively large numbers of women (each between 250 and 350), but these women account for 36% or less of their respective legislatures. On the other hand, while Rwanda has a much lower number of women (59) in its legislative body, they account for the largest share of members (56%) among all the countries analyzed. The next-highest shares are in Cuba and Bolivia, where women account for 53% and 52% of their legislative bodies, respectively. Several countries have both considerably large numbers and shares of women in legislative seats. In Cuba’s and Mexico’s large legislative bodies – both have more than 600 members – women account for both a high number (322 and 304, respectively) and share (53% and 48%). Yemen has the lowest share of women in legislative seats. The four women in its 412-member House of Representatives and Shura Council account for just 1% of members. Three countries included in the Inter-Parliamentary Union data do not have any women in their parliamentary bodies: the Federated States of Micronesia, Papua New Guinea and Vanuatu. Papua New Guinea and Vanuatu had women in legislative bodies in 2008, but Micronesia did not. Bolivia has seen the largest percentage-point increase in the share of women in its legislative body since 2008. Today, women hold 52% of legislative seats in the Bolivian Plurinational Legislative Assembly, up from just 15% in 2008 – a 37-point increase. Mexico and Nicaragua followed with 26-point increases; women now hold 48% and 45% of legislative seats, respectively. Some countries have seen declines in the share and number of women in their legislatures. Liechtenstein’s 25-member Landtag is 12% female as of this year, down from 24% in 2008. In Swaziland, the number of women fell from 21 to 12 in a decade, and their respective share of that country’s 99-member legislature – it had 95 members in 2008 – fell from 22% to 12%. Five countries saw no change in the share of women in their legislature from 2008 to 2019: Finland (42% of 200 legislators in both years), United Arab Emirates (23% of 40), Eritrea (22% of 150), Belize (11% of 45) and Lebanon (5% of 128). 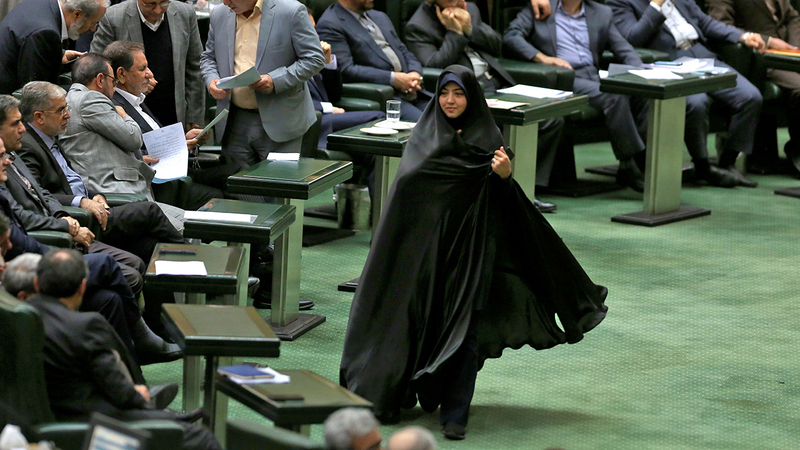 Some countries have laws requiring that women make up a certain share of parliamentary members. For example, Rwanda has a constitutionally mandated quota requiring that women account for at least 30% of all decision-making bodies in the government, including its bicameral parliament. (Rwanda also has a governmental body that monitors elections for gender equality.) Other countries, including most South American and European nations, have legislated gender quotas for candidates or quotas adopted by political parties. Certain countries included in this analysis have parliamentary bodies that serve strictly advisory roles and do not have full voting power. For example, all 150 members of the parliamentary body in Saudi Arabia (an absolute monarchy) are appointed by the country’s king, who in 2013 decreed that one-fifth of members (30 seats) should be female. While this body has limited powers and cannot pass or enforce laws, women accounted for 20% of seats in 2019. Women held no seats in 2008. Analyzing the landscape of women in legislative bodies around the world is challenging, especially when tracking it over time. Legislatures continually change in size and makeup, and availability and quality of data can vary from year to year, particularly in countries that have encountered political unrest. Complete data were unavailable for Afghanistan in 2019 and for Bangladesh and Turkmenistan in 2008. Brunei, Fiji, Guinea and Myanmar were not included in IPU’s dataset in 2008. As a result, these countries are excluded from the change-over-time analyses. South Sudan, which became independent from Sudan as a sovereign nation in 2011, is only included in the 2019 analysis. Sara Atske is an assistant digital producer at Pew Research Center. Alissa Scheller is an information graphics designer at Pew Research Center.